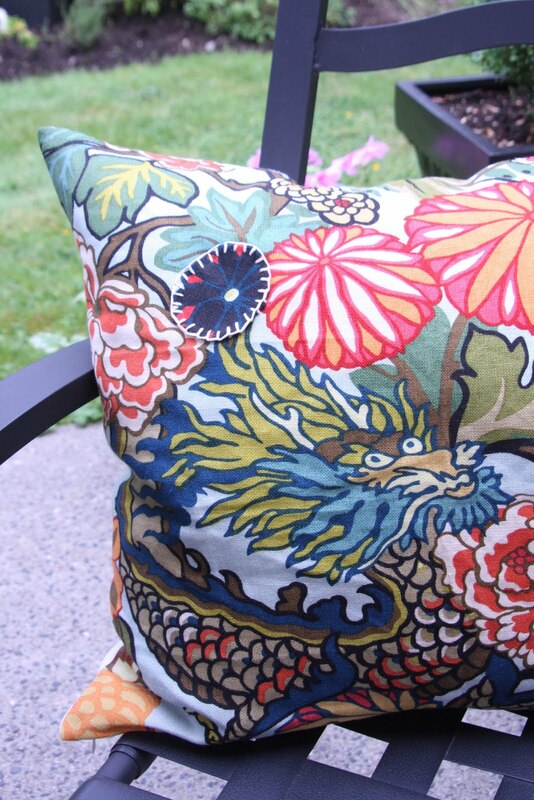 Not letting the whole grommet issue stand in my way, I managed to whip up a fabulous pillow with my second memo of Chiang Mai Dragon from Schumacher. My saga began last November when my wonderful blogging friend Karla took Nancy and I to fabric wholesalers. When I saw the generous sizes I thought , "Yes! I can make pillows"
But they did not deter me. And now the second pillow is complete. I cut and appliqued a flower over each grommet using a blanket stitch. And sewed an invisible zipper. This fabric just makes my heart go pitter patter. It looks gorgeous and what an inventive way to cover those grommets. You are so talented. What a smart way to hide the grommets! :) Your pillows look great Barbara! Those pillows are so fantastic! I want to make one!! Gorgeous! Such creative solutions for each pillow. They are stunning! That's awesome! So smart... I can't wait for the invisible zipper tutorial! Beautiful fabric! I love the black trim on the first one. Love the blog, full of great DIYs! Such a smart idea! The pillows are beautiful! I had to look twice to try to find out exactly where the grommets were. This is certainly a a real good thing! Oh Barbara, how I LOVE this!! I think adding that detail takes it over the top!! What a brilliant solution. I really had to look to see the patches! So glad you could save the fabric Barbara! Love your pillows! I love how you cleverly hide those grommets! OMG you are a genius, this is amazing!!! It looks even better with the appliques! LOVE!!! Brilliant! The fabric makes me want to wake up early and paint a canvas just like it..thanks for the inspiration and the designer lingo! Perfection ! Have a great long weekend! Mmmmm ... 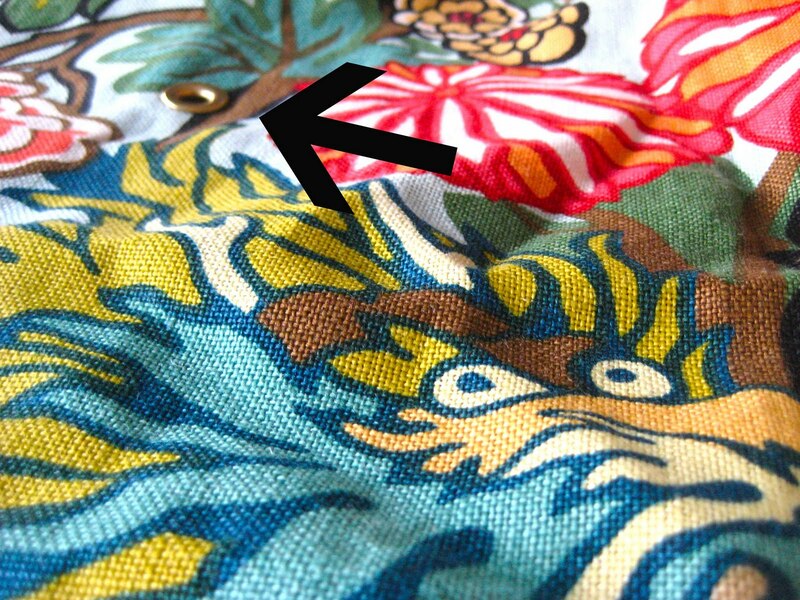 I am sooooo in love with that fabric! I love the way you made the most of it, great job. Amazing work! It honestly looks like those patches were made to be there! Brilliant! Barbara, I love this! You're one talented Lady :) Just beautiful! OK....gotta tell you this was brilliant! Both pillows are fabulous. I was wondering how you were going to get around those grommets.